18 Best Air Fryers — Which Air Fryer is Best? You’ve been introduced to the various types of air fryers available on today’s market, as well as their features and accessories. Now, you may wonder, Which one should I buy? We’ve rounded up a list of 18 of the best air fryer models on the market. After extensive research, we consider these air fryers to be the best choices in terms of price, versatility, and value. In the product reviews that follow, we will examine the features and qualities of each model, as well as what we and other owners like and dislike. In this way, you will be able to make an informed decision as to the air fryer that best suits your family’s needs. 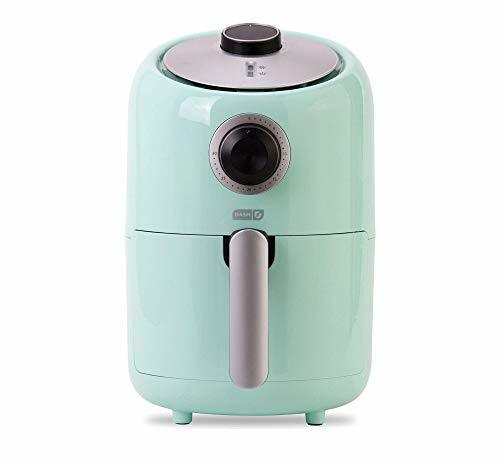 For small families or individuals, this compact air fryer will make a perfect addition to your kitchen – even if said kitchen offers little counter space. 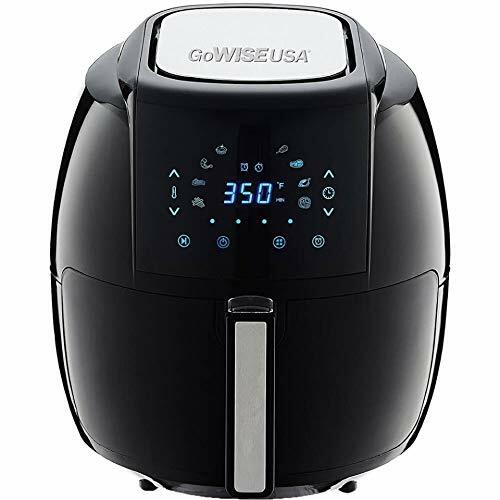 The basic 1500 watt Cozyna 3.7 quart air fryer has manual controls for temperatures up to 400 degrees Fahrenheit and cook times up to 30 minutes. The ergonomically designed fryer basket handle is “cool touch” for increased safety. All parts are dishwasher safe to ensure easy cleanup. Digital and XL versions of this air fryer are also available. This small, egg shaped air fryer is black in color with silvertone accents. Perfect for smaller spaces, the air fryer is 13 inches tall and has a footprint of 12.2 by 11.5 inches. It weighs only 11 pounds. Do you content with small spaces for small families, yet find that a digital display is important to you? 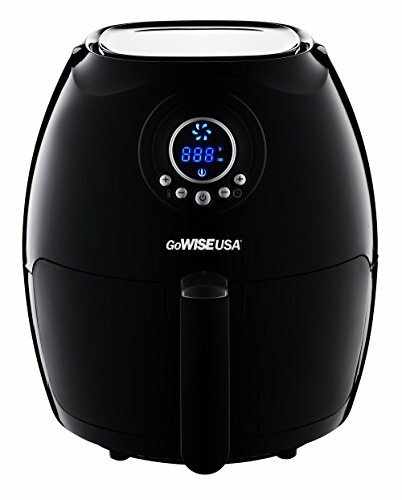 If so, this GoWise digital air fryer is an obvious choice. The touchscreen digital display allows you to set your temperature and cook time manually, or you can choose from seven different “smart programs.” These include presets for chips, meat, chicken, fish, steak, and shrimp. Temperature may be set from 175 to 400 degrees Fahrenheit, and the maximum cook time is 30 minutes. As a safety feature, the fryer is designed to turn off automatically when the frying basket is removed. The large, blue digital display of this air fryer is a soothing hue and easy to read. This air fryer comes in standard colors, such as black, as well as a number of fun colors, such as red or purple. It is egg shaped with silvertone accents. This small air fryer is 9 inches tall, with a footprint of 12 by 8.5 inches, and it weighs only 12 pounds. If the preceding air fryers seem a bit small for your family, the 4.2 quart Secura air fryer may be just the right fit for you. The 1500 watt Secura air fryer has manual controls for temperatures between 180 and 390 degrees Fahrenheit and cook times up to 60 minutes – a bonus for slowly cooking meats or casseroles. Non-slip padded feet insure that the air fryer will stay in place on your countertop. The fryer basket and pan are non-stick for convenient cleaning. 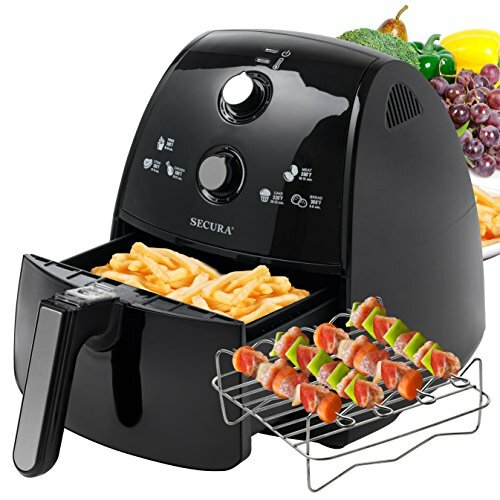 The Secura air fryer also comes with a barbecue/toaster cooking rack and four kabob skewers. Its “cool touch” exterior affords added safety, as does the auto shut off feature. The air fryer comes with a two year manufacturer’s limited warranty. If counter space in your home comes at a real premium, these smallest of air fryers may be the best choice for you. They are a great addition to college dorms, economy apartments, RVs, and tiny homes. The Dash is one of the smallest air fryer on the market, and it comes in trendy colors to enliven any kitchen. The Dash air fryer has manual controls for cook time and temperature. For safety, the appliance automatically shuts off when the 30 minute timer runs out. It is also equipped with a “cool touch” basket handle and exterior housing. Non-slip feet help keep the appliance in place. The fryer basket is non-stick and dishwasher safe to enable easy cleanup. The Dash has a cooking capacity of 1.2 quarts, suitable for preparing one serving of your favorite food. The Dash is narrow and lightweight. It is just over 10 inches tall, with a footprint of 11.5 by 8 inches. It weighs only 5.7 pounds. The temperature control is located on the top, the timer on the front. The Dash comes in fun colors to match any decor, including aqua, black, grey, red, and white. Each model has silver accents. The Bella is a small, sleek air fryer in a classic matte black. 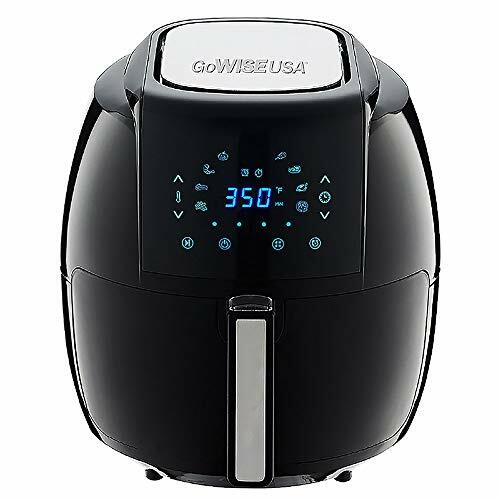 The 1500 watt Bella air fryer employs a stainless steel heating element and manual controls, including a timer up to 60 minutes and temperatures from 175 to 400 degrees Fahrenheit. The appliance automatically shuts off when the timer runs out. The removable basket is dishwasher safe for easy cleanup. The Bella air fryer has a 2.5 liter capacity. It has a sloping design in classic black and silver to fit any decor. The air fryer is 14 inches tall and has a footprint of 11.4 by 13.2 inches. It weighs only 9.8 pounds. Black & Decker is a long trusted brand. Now, you can trust them to meet your air frying needs. The Purifry has manual controls, including an on/off button, a 60 minute timer, a pre-heat indicator light, and a temperature control ranging from 175 to 400 degrees Fahrenheit. As a safety feature, the fryer automatically turns off when the timer runs out. It also sports a “cool touch” handle for removing food. This model comes with a frying basket separator, with allows you to cook two different kinds of food at once without mixing their flavors. Removable parts feature a non-stick coating and are dishwasher safe for easy cleanup. The 2 liter Purifry has a cooking capacity of about eight cups. The Purifry comes in your choice of black with silver accents or white with black accents. The fryer is 13 inches tall with a footprint of 11.5 inches. It weighs 12 pounds. 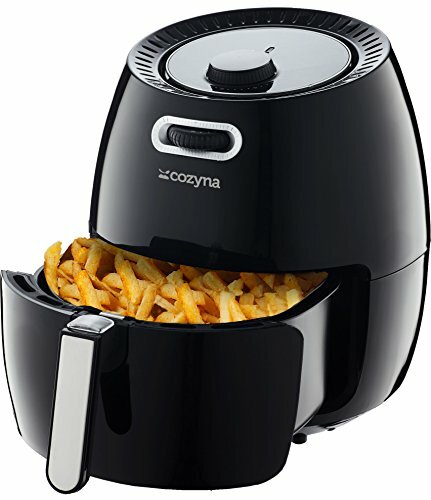 This air fryer from Cozyna is large enough to cook a meal for the entire family. For an air cooker of its size, the Cozyna 5.8 Quart can be considered a bargain buy, combining high quality with a reasonable price. The 1700 watt Cozyna air fryer has manual controls, featuring temperature adjustments up to 400 degrees Fahrenheit and a 30 minute timer. This model comes with a unique basket divider which can be placed in the center of the frying basket to keep flavors separated. Removable parts are dishwasher safe for easy cleaning. The appliance comes with a 60 day money back satisfaction guarantee. 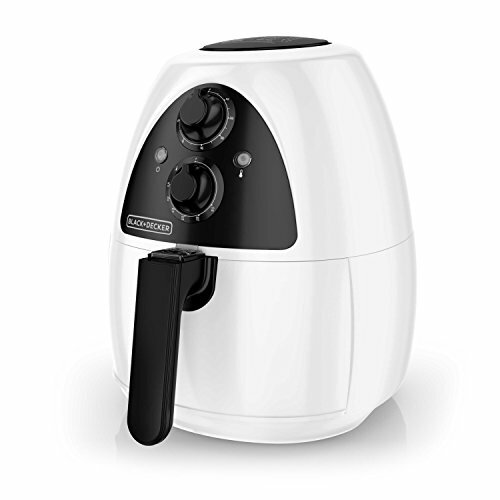 This Cozyna air fryer is egg-shaped with a dished top. It has a capacity of 5.8 quarts, or 5.5 liters. It comes in classic shades of black with silvertone accents. The air fryer is 16 inches tall with a footprint of about 14 square inches. It weighs just under 15 pounds. 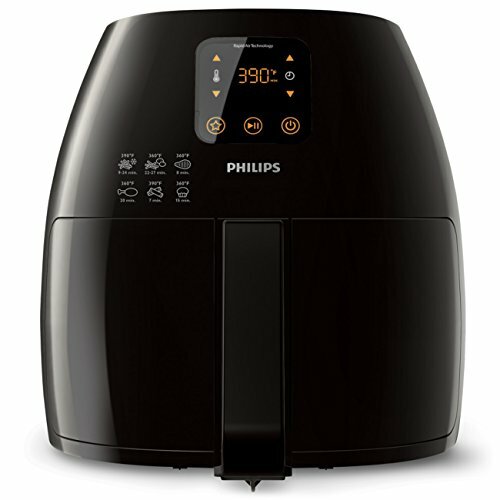 Philips is one of the most trusted air fryer brands as well as most expensive. Philips is known, not only for its warranty, but also for product longevity. Philips air fryers contain high quality parts, such as the stainless steel basket, and some owners report using their Philips air fryer continually for more than five years. Use the smart preset button to remember the time and temperature settings for the food you cook the most, or use the digital touchscreen to control these settings manually. The timer may be set up to 60 minutes, and the temperature up to 390 degrees Fahrenheit. The removable basket and drawer are dishwasher safe. The large, easy-to-read digital display features yellow numerals and symbols. A handy cook time and temperature chart is printed right on the face of the air fryer. It includes suggested cooking instructions for six of your favorite items, including muffins and French fries. The appliance is glossy black in color. This extra large cooker has the capacity to handle 2.65 pounds of food in a single cook cycle. 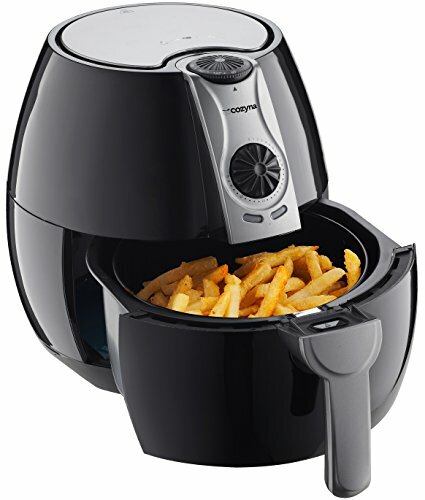 This large air fryer stands 16.6 inches tall, with a footprint of over 12 inches. It is a heavyweight at nearly 19 pounds. In selecting the best value in air fryers, we found that we couldn’t choose just one. Check out the following three air fryers which we feel give the best bang for the buck. This is a small air fryer that still offers the convenience of a digital display. This air fryer is unique in that its controls combine the best of digital and manual devices. A blue-lit display clearly illuminates your temperature and cook time. These settings are controlled manually with plus and minus buttons rather than a control knob. This combination ensures cooking accuracy. Set the timer from one to 30 minutes, and the temperature in the range of 170 to 400 degrees Fahrenheit. An audible timer sounds to let you know when your meal is ready. 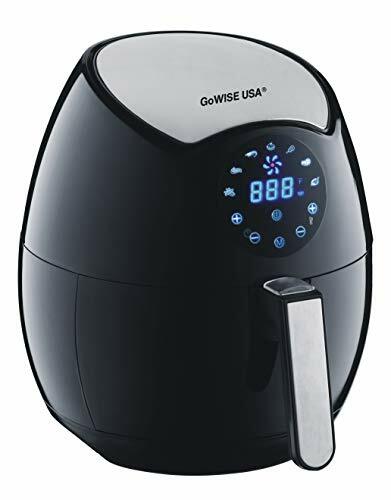 This small egg-shaped air fryer looks much like its “big brother,” a larger GoWise model discussed above. It, too, comes in eight different colors. These include black, white, blush, red, yellow, mint, teal, and plum. This compact air fryer is a real space saver, with dimensions of 11 by 8 by 6 inches. It weighs 11 pounds. This large air fryer has a 5.8 quart capacity, making it ideal for families of four or more. It also comes in a range of colors, more than nearly any other model on the market today. The digital touch screen allows you choose one of eight cooking presets – pizza, fish, shrimp, chicken, steak, pork, fries/chips, or cake. Or, you can set your own cooking temperature in ten degree increments in the range of 180 to 400 degrees Fahrenheit. The cooking timer may be set up to 30 minutes. A start/stop button allows you to change the cook time or temperature in the middle of a cooking cycle. You can also set a “shake timer” to remind you to stir your food at five, ten , or fifteen minute increments. The pan has a cool touch handle, and it, along with the basket, are non-stick and dishwasher safe. The Power Air Fryer Oven Elite is a versatile cooker that will allow you to air fry and much more. With this little oven, you’ll also be able to dehydrate jerky, fruits, and vegetables; grill your favorite meats; and cook poultry, lamb, kabobs, and more in true rotisserie style. 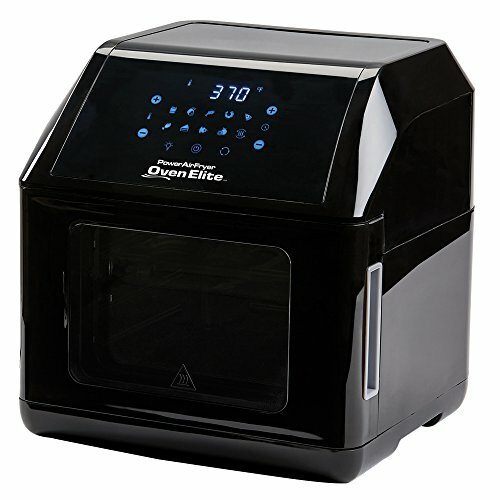 The 1500 watt Power Air Fryer Oven Elite sports a large LED digital display. Controls include ten one-touch preset buttons, as well as time and temperature settings up to 400 degrees Fahrenheit. The machine is equipped with an automatic shut off feature for added safety. Unlike previous versions, the Elite has a door that opens to the side to allow better access to food and easier cleaning. The front glass window is also removable for cleaning. A fry basket, fry basket handle, crisper trays, rotating round basket, fetch tool, drip tray, rotisserie skewers, and rotisserie stand are included. If you’re interested in cooking large food items or cooking in bulk, a countertop convection oven might be the right appliance for you. Countertop convection ovens resemble conventional ovens, but they use fans to circulate hot air as do air fryers. The result? Crispy foods in less time. 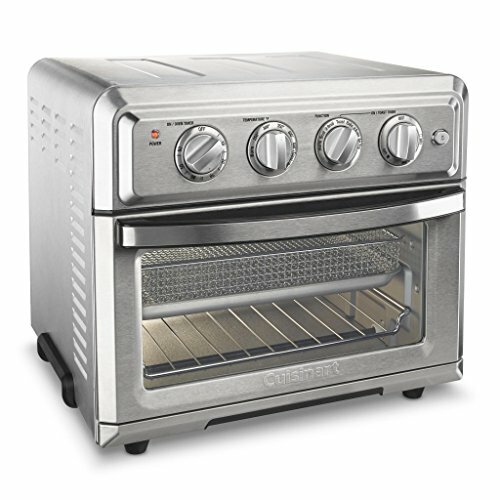 Cuisinart’s 1700 watt oven is versatile. It has seven distinct functions, including air fry, bake, broil, convection bake, convection broil, toast, and warn. The interior has over half a cubic foot of cooking space, and is non-stick for easy cleanup of baked-on spills. Controls include a 60 minute timer with automatic shut off, an adjustable thermostat, and a toast shade selector. Accessories include an oven rack, baking pan, and an air fryer basket. This countertop oven is silver in color and rectangular in shape. The oven door has a large window so that you can keep an eye on what you’re cooking. Inside, it uses two cooking racks or baskets. The manual knob controls are located on the front of the oven, just above the oven door. The oven is 14 inches tall, with a footprint of 16 by 14 inches. It weighs 21 pounds. Air Fryer or Air Cooker? Though the names are used interchangeably, we believe “air cooker” to be the most descriptive term for this versatile appliance. Why? Because these oil-less cookers don’t just “fry” food. Nor are they always “oil less”- in fact, a touch of oil added to air cooked foods prior to the cooking process can yield outstanding results. Air cookers can also cook foods in a manner similar to a roaster, depending on the recipe and the settings you use. Then, there are accessories that allow you to rotisserie, grill, bake, saute, and more. What is an Air Cooker? An air cooker is an innovative kitchen appliance that uses superheated air to cook food. It is a relatively new innovation, introduced by the Dutch technology company Philips in 2010. Due in part to consumer trust already established by Philips’ other efficient electronics, the air cooker soon took the world by storm. Air cookers have donned a number of designs, but the egg-shaped or cylindrical design is by far the most popular. These air cookers include a removable pan and frying basket that makes inserting, stirring, and removing food safe and easy. Simple controls for time, temperature, and presets make come in the form of manual knobs or advanced digital displays. Air cookers can be placed in the category of “the next greatest kitchen appliance,” along with family favorites such as the slow cooker and the Instant Pot. While it may not change the course of history, the invention of the air cooker has been a welcome addition to the kitchens of homemakers, college students, and famous chefs alike. How Does an Air Cooker Work? Air cookers use heating elements to warm the air inside to very high temperatures. Natural convection currents circulate this air, assisted by fans within the appliance. Movement of air and high temperatures result in increased heat transfer to the cooking food. The result? Delicious snacks that are browned and crispy on the outside, while still soft and moist on the inside. Are All Air Fryers the Same? While both round and square baskets are dishwasher safe and easy to clean, square baskets offer a distinct advantage. The design of square basket are fryers encourages air flow, so food may cook more easily. This increases potential capacity and reduces burns around the edges which, in turn, leaves less burnt-on residue for you to clean up. Don’t be intimidated by the buying process. Consider the following aspects in order to find the perfect air fryer to fit your family’s lifestyle. Bigger is better: You get the most ‘bang for your buck’ when you buy a larger air fryer. Don’t let the number of air fryer brands overwhelm you. You don’t have to examine every air fryer on the market to discover which is the right fit for you. Why? Because we’ve done the hard work for you. Air fryers differ in power or wattage. Typically, air fryers range from 1,200 watts to 2,100 watts. What do watts mean to you? Higher wattage air fryers will be able to heat faster and maintain hotter temperatures. You may notice that lower wattage air fryers max out at about 350 degrees Fahrenheit, while higher wattage models often top 400 degrees Fahrenheit. Higher wattage models are generally more energy efficient, heating and cooking more quickly. What type of control and display panel is best? Manual (analog) knobs or digital touch screens? This is purely a matter of preference, as both styles are equally effective. Some large-print digital displays are advantageous for those with vision impairments. Manual knobs may be preferred by those seeking an escape from the pervasive effects of modern technology. Some models of both manual and digital air fryers come with handy presets for automatically cooking foods such as meats, fish, fries, and more. Some allow for custom presents as well, in which you can save the cook time and temperature of your most often prepared foods. These options can help you save valuable time. Another consideration is that of buying additional warranties for air fryers with digital controls. Control panels have been known to go bad over time due to the amount of heat they are exposed to. Many retailers offer an extended warranty – typically one to two years beyond the manufacturer’s warranty – for a small fee. Further, some halogen style air fryers use halogen bulbs that are not replaceable; these are known for having a relatively short lifespan. 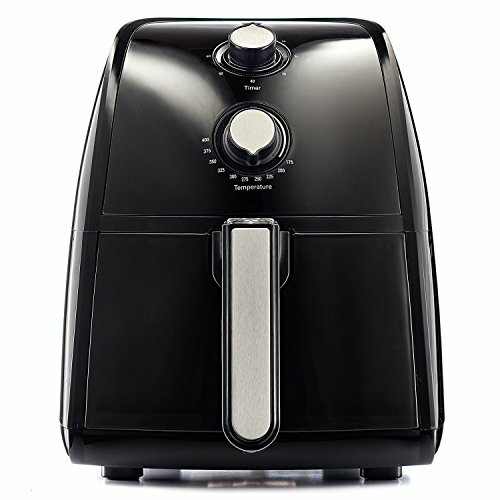 Therefore, extended warranties are advisable for this type of air fryer as well. Air fryers are available in a wide range of prices. If you are on a budget, you can commonly find high-quality air fryers for as little as $49.00. If you’d like to go all-out and bring home all the bells and whistles, high-end air fryers sell for as much as $299.00. These prices are, of course, subject to change, and prices typically drop the longer a specific product is on the market. A good practice is to decide on a budget for your new appliance, then get the most powerful air fryer available for that price. The different air fryer brands have warranties of different lengths. Some warranties are as short as 60 days, while others may extend to two years or more. Warranties can be viewed as a company’s vote of confidence in their product – the product is designed to outlast the warranty, at least. The longer the warranty, the more sound the product may be. Especially if purchasing an air fryer brand known to have a short lifespan, be sure to opt for an extended warranty. No matter which model you purchase, be sure it offers a warranty of at least 1 year. Everyone wants a piece of the air fryer pie – pardon the pun. There are unscrupulous companies out there who offer inferior products, untested and constructed of lightweight materials. While such air fryers may look like a bargain, the product itself may not last long. You may be able to identify such a product by a large number of negative product reviews. If most of the reviews say that the appliance worked for only a few days, weeks, or months, or if it does not offer a warranty, that air fryer may be a dud. Do your research. If you’ve never heard of a certain “generic” brand, look it up. If you can’t find adequate information about the company and the quality of their products, opt for a brand you already trust. The most trusted brands are Philips, GoWise USA, and Cozyna. What can your air fryer and Instant Pot team up to create? Skinnytaste One and Done by Gina Homolka and Heather K. Jones features 140 easy recipes that utilize these and similar appliances. Each recipe in this book is “big on flavor and low on calories and cleanup.”Learn more about air fryers vs. pressure cookers, including the benefits of each. When you use your air fryer and Instant Pot to cook complimentary parts of a meal, you’ll be able to offer your family healthy food, fast! There are definitely a lot of air fryers out there. No matter which model you pick, you’ll have crunchy air-fried French fries, but we hope that this guide has given you the confidence to make the leap.